Our mission is to bring our guests quality religious items for every budget as well as those “one of a kind” gems that are created by Artists who reside and create in Arizona! Via Assisi is always looking to partner with local artists. If you are interested in displaying and selling your work at Via Assisi please submit up to five (5) jpgs of current work, price points, a short bio & 1-2 page resume. Submissions are accepted online only at smoreno@smbphx.org Accepted artists will be notified by email. 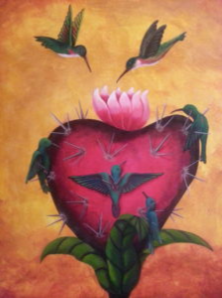 We are extremely proud to have Martin Moreno (2011 AZ Artist of the Year & current Valley Light Rail Artist) at Via Assisi. His work on canvas and one of a kind prints are sure to please our guests. Martin Moreno was born in Adrian Michigan, he grew up speaking Spanish at home and English in school. His parents were hard working people working in the fields and in the foundries. He credits these experiences with providing much of the subject matter which he depicts in his artwork. “My earliest memories of color and rhyme are those of the fields, sitting in the back of a pickup truck watching rows upon rows of corn and tomatoes form a visual pattern of rhythm. Listening to the realities of superstition told by the elders, stories of the Llorona (crier), the Earth, and stories of my glorious past.” All of these images come to life in his sculpture, murals, paintings and mosaics. Mr. Moreno earned his B.A. in Fine Arts from Sienna Heights University. His class was the first to accept men into the all woman Catholic University. Mr. Moreno currently lives and creates in Laveen, AZ. 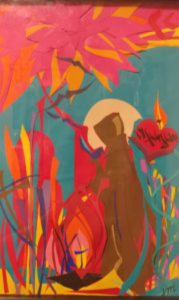 Lynn Mascarelli transforms colorful strips of paper into works depicting her favorite saints; St. Francis of Assisi and St. Claire. Before last year’s Dia de los Muertos Festival I had the pleasure of meeting Ms. Mascarelli who recently retired from a career of teaching at our own St. Mary’s High School. Lynn vended at our event and became a huge hit at our store. Please come in and take a look at her one of a kind artwork and beautiful framed quotes. Ms. Mascarelli makes her home in the Phoenix, AZ area. Sue Messner continues to amaze with her one of a kind creations! Ms. Messmer has been gracing the walls of Via Assisi for several years. 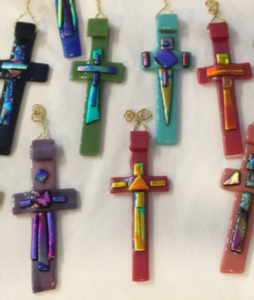 Her crosses radiantly infused with colorful glass draws our visitors with their brilliant colors and stunning designs. Beginning November 4th we have a brand new selection of Sue’s beautiful one of a kind Christmas Ornaments! We invite you to come in and browse our selection! Ms Messmer is a local Arizona artist. 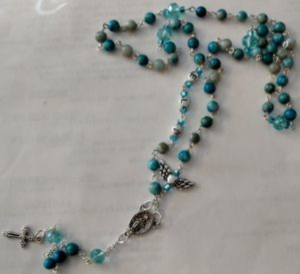 Jewelry and Rosaries handcrafted by Sylvia and Anna local Artisans with a passion for beads & style! Rosaries can be personalized, come in for details. Sylvia and Anna are life long Phoenix residents. As young women they were both introduced to jewelry design and met soon after. Anna has taken a passion to researching saints and hunting for stones and rosary findings to create her work. Sylvia, who learned her craft from her husband, a local Jeweler; creates beautiful necklaces and bracelets all with inspiring messages influenced by her devotion to her faith. 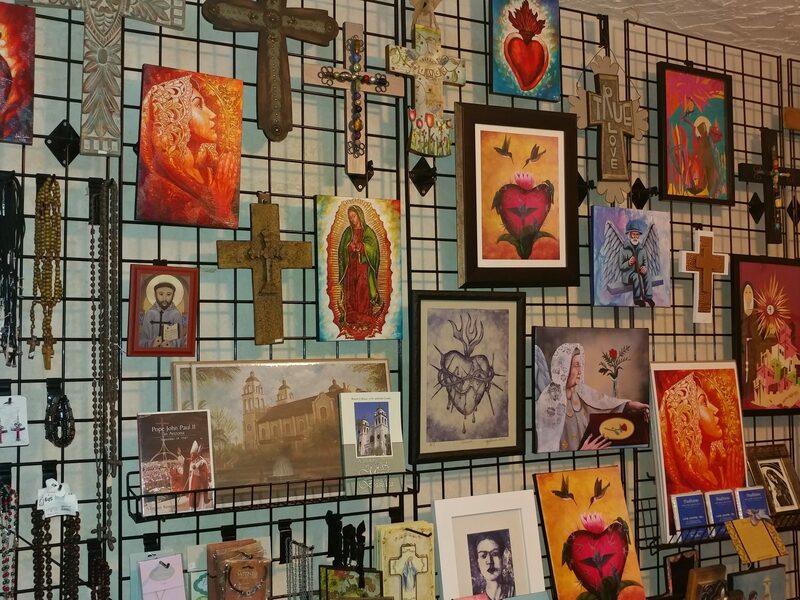 Via Assisi not only supports local artists in our gift shop, we also strive to bring you workshops that will inspire your growth in Christ. We began our events by hosting Katy Cano-Murrillo “the Crafty Chica” who led a workshop of 100 participants in the making of their very own Advent wreaths to mark the coming of Jesus’ birth. The workshop included a brief history of the advent wreath as well as an opening prayer by Brother Scott, Cathy then began the fun with tree trimmings, ornaments, candles and GLITTER! During the month of March we were proud to bring Diana Calderon to the Basilica. Her instruction and engagement with our participants created a fun and dynamic workshop. “The Empty Tomb” is one of many projects I hope to bring to St. Mary’s. My duties to the parishioner’s and community who visit our parish, is not only to bring you a Gift Shop filled with one of a kind items; it is also my goal to bring you new and exciting ways to explore your walk with Christ through our faith based workshops. Evangelization begins with Engagement. 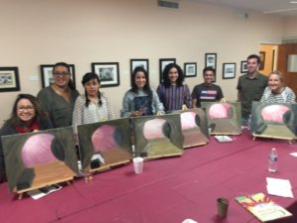 If you have suggestions for workshops or would like to be considered as an instructor in the coming year, please email me at smoreno@smbphx.org I welcome your ideas! In a world where hope seems lost and Christians seem to be losing grip on their faith, there are numbers that tell a different story. The divine surprises and chastisements that shaped the church and changed the world. With 3 passages taken from each chapter in the New Testament, the author invites the reader to “listen in” on conversations he had with the Lord through prayer and meditation, as the author learned the Lord has a lot to say. Hope in Numbers and “ASK” You Said were written by local authors the proceeds from these books have been donated to St. Mary’s Basilica programs. Thank you Mr. Santor (for Hope) and Mr. Holsten (for “ASK”). Being an extremely small shop with a budget to match! There are often things that we find we need to make your shopping experience a much better one. Lighting – donation and/or installation of spot lights in ceiling to illuminate items. Donation of off white paint for interior of store. Volunteers needed as cashiers and/or assistants to manager, training provided. Thank you so much for your patronage. We at Via Assisi appreciates you.